Dr. Stephen Hawking, the renowned British physicist who inspired generations through his accessible descriptions of the cosmos and his public battle with a neurological disorder, shared a long history of innovation with Intel over the years. Hawking, the modern successor to Isaac Newton, died early Wednesday at his home in Cambridge, England. “Working with Stephen was the most meaningful and challenging endeavor of my life. It fed my soul and really hit home how technology can profoundly improve people’s lives. We will continue developing and refining this technology in the open source community in his honor, to reach all people in need. This is something he cared about deeply,” Lama Nachman, Intel Fellow, said Wednesday. 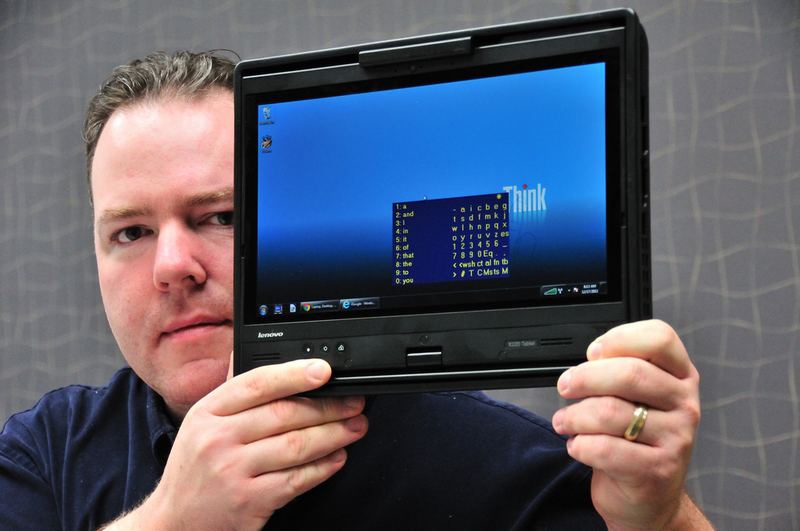 Intel engineer Travis Bonifield holds a replica of the custom PC he recently created for Stephen Hawking. Stephen Hawking’s New PC (Intel Free Press/Newsroom, 1/10/2012): “Intel application engineer Travis Bonifield has been working closely with Stephen Hawking to communicate with the world for a decade. He’s traveled from the United States to England every few years to hand-deliver Hawking a customized PC. At his 71st birthday celebration, Stephen Hawking was presented with a commemorative 300-millimeter silicon wafer by Martin Curley, vice president of Intel Labs Europe. One for the Road: Stephen Hawking’s New Computer (Intel Free Press/Newsroom, 3/6/2014): “When British theoretical physicist Stephen Hawking goes on a trip, there is far more at stake than simply buying a new toothbrush. Hawking is afflicted with advanced Lou Gehrig’s disease and communicates through movements of his cheek muscle. If his computer hardware stops working and cannot be repaired, he can’t communicate with the world, but a new custom-built computer system is making Hawking’s travel easier. How Intel Keeps Stephen Hawking Talking with Assistive Technology (Intel iQ, 12/2/2014): “For two years, Intel has worked to upgrade Stephen Hawking’s computer system, a pioneering assistive technology project that will have far-reaching benefits for the disabled. “Professor Stephen Hawking is arguably as famous for his computerized voice as he is for his ground-breaking work with general relativity and black holes. 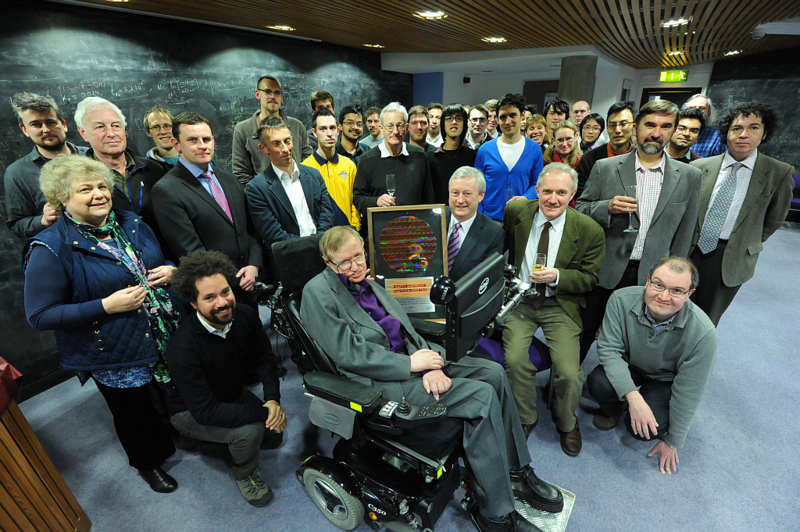 Intel has been working with Hawking since 1997, helping to maintain and improve the assistive computer system that enables him to interact with the world. Stephen Hawking and Intel: Actor Eddie Redmayne Learns History (Intel iQ, 12/11/2014): “Golden Globe-nominated star of “The Theory of Everything” visits Intel to test Hawking’s communication technology, which has the potential to improve lives of disabled people around the world. Lama Nachman Keeps Stephen Hawking Talking with Assistive Tech (Intel iQ, 6/19/2017): “Believing anything is possible led Lama Nachman to become a groundbreaking engineer in predictive computing – and yes, she is on physicist Stephen Hawking’s speed dial. “World-renowned physicist Stephen Hawking had fans laughing when he auditioned people to find a replacement for his trademark computer-generated voice. The spoof for Comic Relief’s Red Nose Day last March revealed for many just how iconic Hawking’s voice is and how its sound is imbedded in the way we think about the universe. Accessing the Mind of a Young Stephen Hawking (Intel iQ, 2/13/2018): “Now digitally accessible to the public through the University of Cambridge, Stephen Hawking’s doctoral thesis laid the foundation for his scientific career. “Within just a few hours of going live to the public in October 2017, theoretical physicist Stephen Hawking’s 1966 doctoral thesis “Properties of Expanding Universes” was accessed 60,000 times, becoming the most viewed document in the University of Cambridge’s Apollo digital repository.